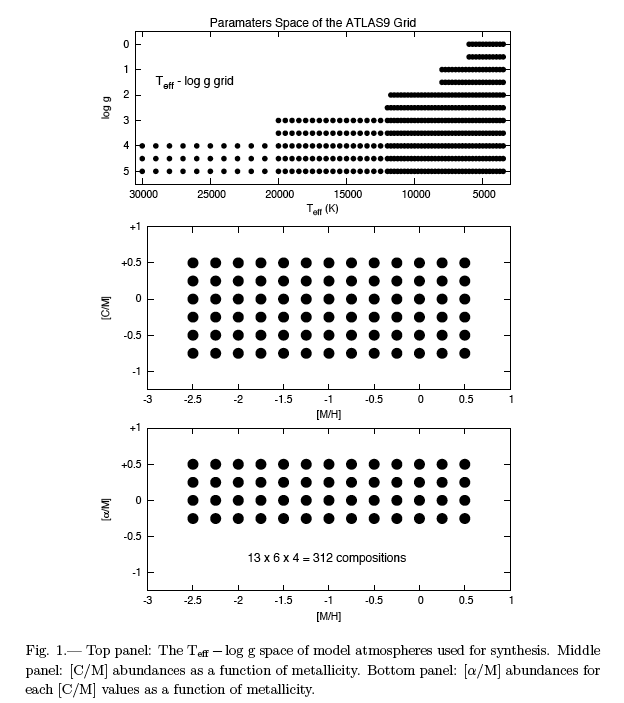 BOSZ Stellar Atmosphere Grid - Bohlin et al. November 2017: An additional set of models are made available with metallicity of [M/H] = +0.75. "BOSZ" stellar atmosphere models are based on ATLAS-APOGEE ATLAS9 (Mészáros et al. 2012) and cover a broad range of effective temperature, surface gravity, metallicity, carbon abundance, and alpha-element abundance. Versions at different instrumental broadenings are provided. See the table in the description section for parameter ranges. Our new BOSZ LTE models have been fit to O,B,A,F,G stars observed with HST/STIS, and those results are compared to fits for the LTE grid from Castelli & Kurucz (2004). The name "BOSZ" comes from a combination of letters in the first and second authors' names. where H_BOSZ is the surface brightness in the file. Normally the equation includes a factor of 4*π, but the BOSZ models are already four times larger, so it is only necessary to multiply the surface brightness values by π to convert to flux in erg cm-2 s-1 Å-1. There are a few ways to download models, depending on how many models you want to retrieve. If < 50,000 files: Use the MAST Web Search Form. If you want to download more than a few files, here's how to use the form to download a lot of files. All models at Instrument Broadening = 300,000 and a given [M/H]: These tar bundles are provided for convenience, for any other combinations of models, use the search form or wget/cURL. where <subdir_path> and <file_name> are defined above in the Data Format section.